As a nurse in the 21st century, you are bound to assist any number of patients in the coming years who are seeking medical assistance for hip pain. In fact, total hip arthroplasties are projected to top half a million by the year 2030 which means you may be serving more patients post-op who received a total hip replacement than ever before. Don’t miss this quick clinical guide to understanding the common causes of hip pain and how they are diagnosed and treated. As the most sizeable weight-bearing joint in the body, the hip naturally experiences its share of wear and tear over a lifetime. Where the top of the femur inserts into the deep sockets of the pelvis, the hip is formed and stabilized with a number of muscles, tendons, and ligaments. Everything from cartilage tears to bone damage, muscle strain, trapped nerves, tendon inflammation, you name it can contribute to hip pain. Hip fracture: Typically the result of a fall or other blunt impact, i.e. a car crash, hip fractures can be life-threatening injuries. Stress fractures, osteoporosis, and cancer can weaken the hip and poor vision, balance problems, and mobility issues can increase an older adult’s risk for falling and breaking their hip. Hip fractures almost always require surgery and extended physical therapy. Arthritis: Hip osteoarthritis specifically is a common culprit among the elderly leading to pain, disability, and frequently, total hip replacement surgery. Researchers have found that risk factors for osteoarthritis-related hip pain include obesity, being a woman, older age, previous experience with a hip injury, and interestingly, low levels of education and income. Other forms of arthritis like psoriatic, rheumatoid, and septic arthritis can contribute to hip pain too. Hernia: Pain localized to the front of the hip and groin area may be the result of an inguinal or femoral hernia. Hernias result when internal tissues (often the intestines) pop through a tear in a weak abdominal wall. Tendonitis: Any number of tendons in and around the hip and upper leg can become worn, torn, and inflamed from injury or overuse. This can lead to hip pain in the form of conditions like IT band syndrome or snapping hip syndrome where tendons are unable to smoothly glide over bone and instead rub with increased friction. Bursitis: Bursae are the fluid-filled sacs that help facilitate fluid, painless joint movement by cushioning the muscles, tendons, and bones. When they become irritated and inflamed, this can lead to bursitis. Symptoms of bursitis will include joint pain, redness, swelling, stiffness, and sometimes even fever. 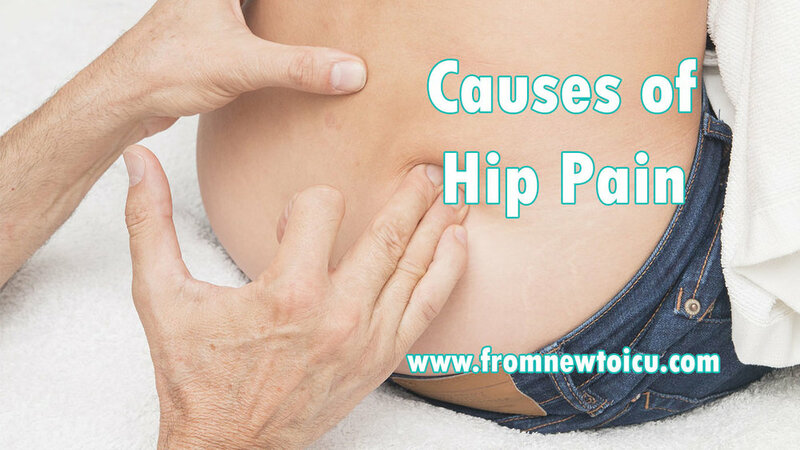 Hip pain may derive from other causes too including sciatica, bone infection, synovitis, dislocation, sprains, hip labral tears, and sacroiliitis. Patients are recommended to seek medical attention when they experience a fall followed by hip pain, when hip pain lasts more than a few days, when they are unable to move their leg or bear weight, and when there is intense pain, swelling, or deformity in and around the hip. In addition to conducting physical exams and covering medical history, doctors will order imaging tests (x-rays, MRI’s, CT’s, etc.) to help get a clearer picture of what exactly is going on inside the hip joint. Recently, German researchers from Heidelberg University Hospital revealed a new link between depression, obesity, and chronic hip pain in a study published in Musculoskeletal Care. Their findings highlight that hip pain might be sourced to psychological factors like depression and fear in addition to pathological changes to the joint. They also put out a new call for healthcare professionals to screen patients complaining of hip pain for comorbidities. Hip pain may be disguised as groin, knee, thigh, or back pain as well which is important for nurses and other care team members to recognize. Any condition which inhibits a patient’s mobility can cause a cascade of behaviors that are detrimental to their health and longevity including reduced physical activity and social isolation. The goal for patients with conditions that contribute to hip pain will always be to recover as much independence and function as possible. Thusly, treatments from surgery to cold and heat therapy to physical therapy, massage, and prescription and over-the-counter medications may be recommended. Gains are being made in science and research every day though. For example, the Annals of the Rheumatic Diseases reports that patient education and exercise therapy can reduce an osteoarthritic patient’s need for total hip replacement surgery by 44 percent!